All eyes are now on Sen. Miriam Defensor Santiago, from different controversial issues, critiques from different personalities while the light part, is the rumored guesting of honorable Sen. Miriam Santiago in the upcoming Boy Pick-Up: The Movie lead by Ogie Alcasid. So we to collect and compiled those best pick-up lines by Sen. Santiago. 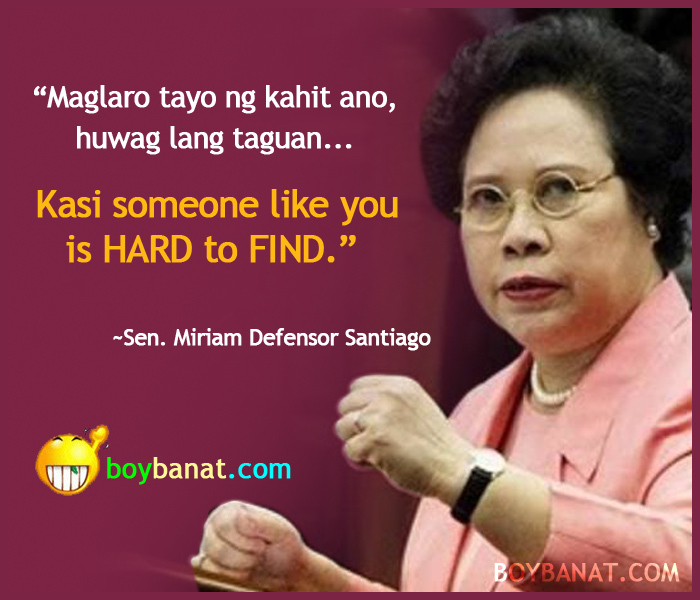 Check out this Sen. Miriam Defensor Santiago's Best Pick-up Lines Collection and Miriam's Banat, Quotes and Jokes collected just for you and even can share it on your facebook wall. If you have your own Sen Miriam Santiago Pick-up Lines Banat Pick-Up Lines , we would love to hear it, simply add a comment below or just email it to us with a subject: miriam pickup. Hope you'll like it! “Maglaro tayo ng kahit ano, huwag lang taguan. “Empleyado ka ba? Empleyado rin ako. If you have you own Sen. Miriam Santiago's Pick Up Lines, feel free to share it with us and we will be very glad to have it posted here. For more reads, just log on to www.boybanat.com or visit Boy Banat Official Facebook Page for the latest features. "Sana naka off ang ilaw, para tayo na lang mag on." FALSE ASIA'S SURVEY ON BINAY'S CORRUPTION WEALTH RISE TO 70% BUT STILL ACCELERATING'S IT'S PEAK. MAM CRUSH NA CRUSH KITA KAYA LANG ISA LANG ANG PUSO KO. MAM PANAY ANG KAIN KO NG PUSO NG SAGING BAKA MAGING DALAWA ANG PUSO KO. MAM BILIB AKO SA ULO NYO ! MAGINGAT KAYO SA ISIS. Madam Senator Miriam Defensor Santiago, dictionary ka ba? Kasi, ikaw ang best definition of brilliance! MAM SABI NI POE WALANG FOREVER * SI CHIZ MAY 4 - UBER SAKAY LANG NG SAKAY KAY POE HINDI KAY HURT ? PERFECT BA ANG MATH MO YES * SI BINAY DIN * 1 + 1 = 11 * OVERPRICED ?